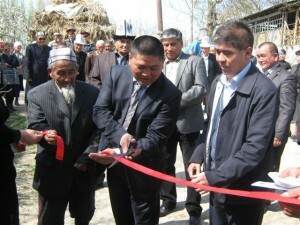 April 4, 2013 there was the solemn ceremony of putting into operation the new water supply line in Kyzyl-Koshchu village, Kara-Su region of Osh oblast. There are living 580 families and 2 500 people in Kyzyl-Koshchu village. Water supply line was constructed in 1970 and for 40 years of operations the water supply system became useless. People of the village was obliged to go for water to neighboring villages for economic needs and cooking during about several yearsand and use polluted water in spring and fall, which is harmful for their health. The Bank “Bai-Tushum and Partners” allocated 1 281 554 KGS for carrying out overhaul of water line and providing people of the village with drinking water. «Today water providing for people of villages is one of the main problems in republic scales. In 2013 the Bank is planning new projects on irrigation system and access to clear drinking water. Successful implementation of each similar project has strategic meaning; because investing to projects of clear water, we are investing to health, prosperity and increasing of living standards of people in regions – emphasized Gulnara Shamshieva, General Manager of “Bai-Tushum and Partners” MF Bank. Moreover, it should be mentioned that additionally the access to clear drinking water was also provided to socila objects of Kyzyl-Koshchu village: the school, the kindergarten and medical points. At present all works on this object are completed, the water line was transferred to balance of village board “Joosh” of Kara-Suu region in Osh oblast. «Bait-Tushum and Partners» was founded in 2000 by the American international organization of development ACDI/VOCA. In November 14, 2012 “Bai-Tushum and Partners” became the first microfinance organization in Central Asia, obtained full banking license from the National Bank of Kyrgyz Republic. For 12 years activity the organization became the one of the large microfinance institutions in the Kyrgyz Republic with total assets of 100 million US dollars. Today, Microfinance Bank “Bai-Tushum and Partners” entered to six large banks of the Kyrgyz Republic, serving of more 30 thousand clients. In 2012 the Bank financed and successful implemented 5 social projects in Talas, Chui, Jalaabat and Naryn oblasts for total amount more 2,21 mln. KGS.